Branford Land Trust Work Parties offer a chance to get to know our properties, to do some good outdoor work, and to spend a little time with some great people. If you have school age kids, this is a chance for them to pick up some community service credits. Call Bill Horne (203-488-6146) for more information. We will clear the trail that runs along the top of the ridge, which has become overgrown by Euonymous. Meet at 9:00; park along the side of Cherry Hill Road across from Montoya condominiums. Enter the property at the end of the rail fence nearer to Rt. 1 and follow the trail across the dam and up the ridge. Bring loppers, clippers, small saws and work gloves. Call Bill Horne (203-488-6146) for more information. We will continue our effort to remove invasive plants, especially Japanese barberry, from the Weil tract of the Jarvis Creek Preserve. Meet at 9:00 at the Buena Vista Rd cul-de-sac. There is limited parking at this end of Buena Vista Rd, so parking on Thimble Island Rd and walking up is encouraged. 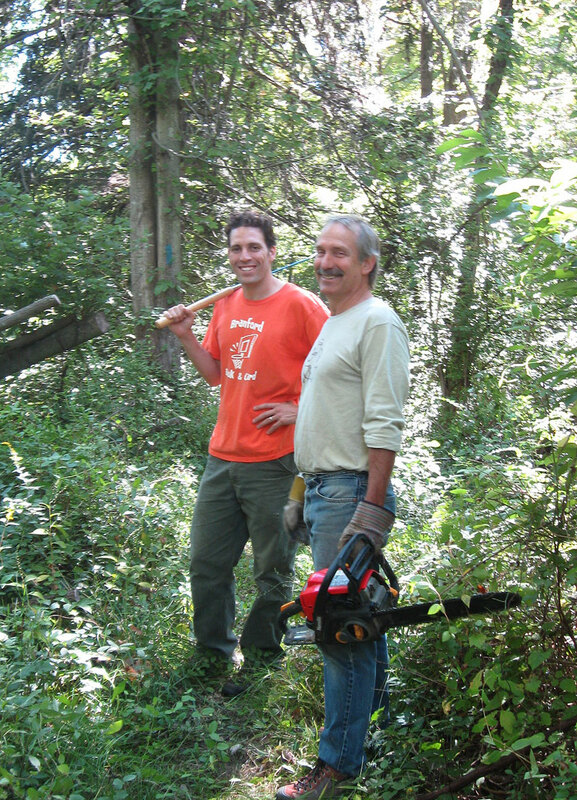 Bring loppers, small handsaws, sturdy hand clippers, mattocks and work gloves. For more information, call Bill Horne (203-488-6146). We will return to the Sybil Creek property next to the Bruce & Johnson marina to continue cutting bittersweet and other climbing plants that are strangling the trees on this important upland part of the Sybil Creek Preserve. Meet at 9:00 am. Park next to the woods between buildings #3 and #4 (on the left immediately after entering the Bruce & Johnson Marina at the end of Block Island Road. Bring loppers, small handsaws, sturdy hand clippers, and work gloves. Call Bill Horne (203-488-6146) for more information. We will clear the edges of the field of woody shrubs and saplings that have grown out into the field and are interfering with the mowing. Meet at 9:00 am. Bring loppers, small handsaws, sturdy hand clippers, and work gloves. Park on Whitewood Drive near Flat Rock Rd. We will walk in across the end of the driveway at #32 Flat Rock Rd (across Flat Rock from Whitewood). Call Bill Horne (203-488-6146) for more information. We will continue the clearing of woody shrubs and trees from the field on the Stony Creek Limited Partnership Preserve to maintain the old-field character. Meet at 9:00 am. Bring loppers, small handsaws, sturdy hand clippers, and work gloves. Park on Long Point Rd or Wallace Rd (the far intersection of Wallace Rd with Thimble Island Rd, opposite Long Point Rd). We will walk in along the private driveway marked 50 Wallace Rd. Call Bill Horne (203-488-6146) for more information.